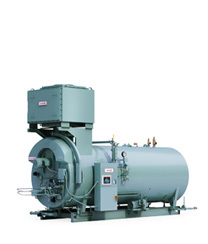 Typical uses/applications: Comfort heating and low temperature process loads. Typically used in schools, decentralized institutional facilities, apartments and other commercial buildings. Typical uses/applications: Wide array of uses from hot water and low pressure steam heating loads to process loads. Typically seen in heating loads when oil firing is required, or the load is large. Commonly used in Central Utility plants in hospitals, food processing facilities, corrugators or other heavy duty applications. Typical uses/applications: Wide range of uses from hot water and low pressure steam heating loads to process loads. Typically used in hybrid heating systems and when oil firing is required, and for smaller process loads. Typical uses/applications: Central steam plant and process loads. Used when large capacity or high pressures are required. Typical uses/applications: Small units used when venting is not possible and for point-of-use steam loads. Large units used when electric rates are competitive and emissions or other factors favor. Typical uses/applications: Used when high amounts of hot waste gas is available such as on a turbine or process exhaust. Want to hear more about what is new in boiler equipment and explore the best option for your organization? Contact us to set up a no-obligation Lunch and Learn. Hybrid heating systems combine condensing and non-condensing boilers in a common heating system for either variable water temperature design or backup fuel requirements. Buying new boiler equipment is a big deal. Our team can help you with budgeting, system advice and consultation, energy audits, and contingency planning. You get exactly what your organization needs—nothing more, nothing less.